- Music Video "I Can't Take My Eyes Off Of You"
The power of music continues to explode in this spectacular, show-stopping, two-disc REMIX EDITION of the Emmy(R) Award-winning HIGH SCHOOL MUSCIAL! The smash-hit Disney Channel Original Movie everyone is talking about now features hours of awesome new bonus features that will rock your world. Take a front-row seat on the red carpet for the star-studded Hollywood premiere, and join the High School Reunion, where the cast reunites in an exclusive interview where they talk about how their lives have changed dramatically since being a part of this movie phenomenon. Plus, stand up and experience the Dance Along (as seen on Disney Channel), where Troy, Gabriella, Sharpay, and Ryan give step-by-step instructions to popular dance sequences "Get'cha Head In The Game" and "We're All In This Together." Hear two exclusive remix versions of your favorite songs and watch three new music videos. HIGH SCHOOL MUSICAL REMIX EDITION is everything you've been looking for -- and more! In Disney Pixar’s Oscar-winning Finding Nemo (2003), Marlin the clownfish says: “I’m feeling happy, and that’s a big deal… for me.” This is indeed the same sentiment for this reviewer after watching this Disney Channel Original Movie. The wildly successful television movie premiered in the United States in January 2006, and its popularity spread like wildfire across the world. Looks like happiness is contagious, and that’s a good thing in our opinion. The movie tells the story of a boy and a girl who meet at a karaoke contest and discover their love for music, and for each other. Throw in some side plots like opposing parents, green-eyed classmates and an upcoming school musical performance, and you’d have one great teen drama that reminds you of those good old days you had. In great Disney tradition, director Kenny Ortega (also the choreographer!) has the 98-minute movie playing out with catchy and preppy tunes that will have you humming happily, energetic and well-choreographed dance sequences that will have you tapping your feet happily, and most importantly, a wholesome and hearty story that will have you smiling ear to ear happily. It’s like Grease for today’s generation. The earnest performances by teen stars Zac Efron (he had to change his mobile phone number after fans repeatedly harassing him! ), Vanessa Anne Hudgens (she has released her solo album in September 2006!) and Ashley Tisdale (she has her own Youtube Channel!) will win your hearts in the most charming ways. Sure, the plot (like we don’t already have enough movies telling us to be true to ourselves already) is predictable, the songs (The titles of “Breaking Free” and “We’re All In This Together” tell it all) are cheesy and over-pleasing, the lines (“Do you remember in kindergarten, how you'd meet a kid, and know nothing about them, then 10 seconds later you'd be playing like you were best friends”) are conventionally feel-good – but there is an endearing and captivating formula to this movie that works. Why else would it have garnered a handful of accolades including Emmys and Teen Choice Awards? Why else would the movie soundtrack climb to the top spot on the Billboard album chart twice in March 2006, and be 4x Platinum? Oh, and there’s a reason why there are not one, but two upcoming sequels for this phenomenal picture. The movie makes people happy, that’s why. And that’s a really big deal in cynical times like this. We are talking about the fastest-selling television movie DVD here, and after releasing a single-disc edition in May 2006, the producers must have realized what a money-milking cow this is. So here it is: a two-disc edition with more special features, a prettier cover and an overall packaging that makes you feel happier. That’s one good deal. 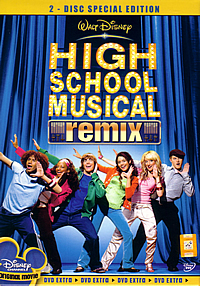 Music Videos – Fans of the movie would have grown tired of the “Breakking Free” music videos which received lots of airtime on Disney Channel, so this disc would be a godsend, with all-new videos of “I Can’t Take My Eyes Off You”, “We’re All In This Together”, funky remixes of “Breaking Free” and “We’re All In This Together” (they are targeting party-going teens here) and a Spanish version of “What I’ve Been Looking For” entitled “Eres Tu” (It’s a worldwide phenomenon, remember?). Bring It All Together: The Making of “High School Musical” – This 9-minute featurette has the young actors of the movie talking singing praises about their director, who has brought them an incredible of fame (and probably fortune) with his movie. They also talk about dancing and singing on set, which looks really tiring to us. Learning the Moves – In this 4-minute segment, director Ortega presents how the song segment “Bop To The Top” was rehearsed. Together with his associate choreographers, you can choose to watch this clip in different angles, and finally enjoy it as the final version in the movie. Nope, we didn’t try dancing along. Hollywood Premiere – The young stars of the movie look really happy in this 3-minute featurette which sees them attending their movie premiere in Hollywood (complete with red carpet, eager press and screaming fans). You also see how smart the producers are when they sneakily include interviews of stars from other Disney Channel shows like Cheetah Girls 2 and Hannah Montana. A High School Reunion – The stars look really happy and enthusiastic in this 6-minute clip where they talk about where the successful movie has brought them. Each of them tells us what they were doing before the movie, and their upcoming projects. Footages of their Australia and London promotional tours are also included. Really, we feel happy for them too. High School Musical Dance-Along – This has to be the most amazing featurette on this DVD. The16-minute featurette which was previously shown on Disney Channel teaches us how to dance along to the tunes of “Get’cha Head In The Game” and “We’re All In This Together”. The stars take turn to slowly demonstrate the steps, and then putting it together in half speed, and eventually full speed. They are really nice, repeatedly telling us not to worry if we do not get it right the first time (not everyone has good motor-coordination skills you know). Did this reviewer manage to master the energetic dance steps? Check back in half a year, perhaps. Trailers – Included on the disc are DVD trailers for Disney productions like Cars, The Wild, Snow Dogs and Stick It. The visual transfer on this Code 3 disc showcases the vibrant colours of all the dance sequences, making it a very good visual treat. Other then English/Spanish/Portuguese language options, you can watch the movie in its original version (with or without subtitles) or its “Sing Along” version where lyrics will pop up whenever a tune is being warbled. Yes, go ahead, you know you want to sing along at home!